Several European clubs are looking to West Africa when searching for goalscorers. At the time of writing, one of the most interesting strikers from the Ivory Coast is Mamadou Soro Nanga from AFAD Djékanou. Soro Nanga is a natural goalscorer who caught some major headlines last weekend. On 17.02.2013, AFAD Djekanou won 5-1 against Diamond Stars FC from Sierra Leone in the preliminary round of the 2013 CAF Champions League. Sensationally, Soro Nanga scored all five goals for the Ivorians. It is not easy to write the football history of Soro Nanga. As far as I know, Soro Nanga is a former player of EFYM (Ecole de Football Yéo Martial). EFYM played at second level of Ivorian football during the seasons 2010, 2011 and 2012 and I don’t think Soro Nanga has played top level football in the Ivory Coast before joining AFAD. Soro Nanga signed for AFAD Djékanou in October 2012, apparently from a second level club from Mali. I am not able to find out the name of this club. However, a “Mamadou Soro” played for top level side Onze Créateurs from Bamako in 2011 and 2012. I don’t know if this is Mamadou Soro Nanga of AFAD. At the time of writing, Soro Nanga has scored two goals during the first 13 of AFAD’s matches of the Ivorian Ligue 1 2012-2013. Soro Nanga is a centre forward and competition at AFAD, primarily from N’Gao Yao Koffi, Issa Sanogo, Yannick Zakri and Jean Jorés Zoukouri, is very tough. From my point of view, it appears that Soro Nanga has been a first choice striker at AFAD since December 2012. In January 2013, Soro Nanga was included in the squad of the Ivory Coast B national football team. 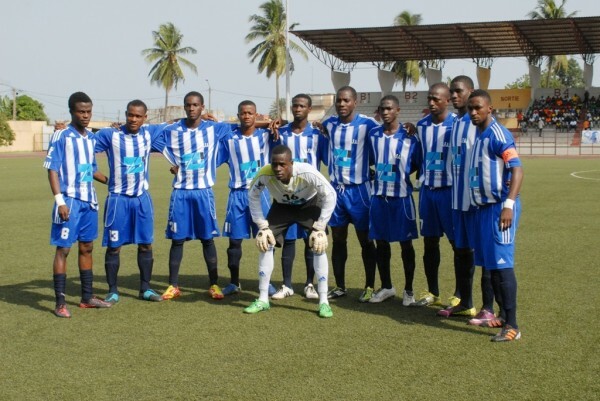 Ivory Coast B is preparing for the “2013 Tournoi de l’UEMOA”. From my point of view, it is a sign of quality that the Fédération Ivoirienne de Football has discovered the talents of Soro Nanga. This usually means that he will get backed up by the governing body of football in the Ivory Coast, and that he will participate in training sessions of high quality. Information found on L’intelligent d’Abidjan suggests that Soro Nanga is born 20.04.1993. This piece of information is backed up by Foot Surf, where it is written that Soro Nanga was 15 years old in September 2008. The picture of AFAD was found on www.ligue1-ci.com.